An Iowa lawmaker is pushing legislation to force the D.N.R. to reopen the Maquoketa Caves. The caves closed in 2009 to protect bats from a fungus called "white nose syndrome". "Not only do the people of Maquoketa enjoy the entertainment value, there's also a tourism issue too," said St. Sen. Tod Bowman, (D) Maquoketa. Bowman says the possibility of the Department of Natural Resources providing guided tours through the caves of Maquoketa State Park isn't enough to bring back the tens of thousands of visitors lost when the caves closed in 2009. "Let's get those caves open," said Bowman. "What we're saying is Minnesota already opened their caves. We need to open our caves." 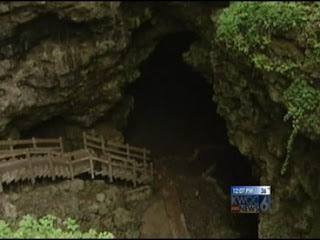 According to Bowman, more than 200,000 people visited Maquoketa State Park in 2009 but after the caves were closed he says that number dropped by 80 percent to 40,000 people each year. "The people that visit the caves have a tremendous economic impact that trickle down to the main street, the businesses that you know, legislators are very concerned about," said Bowman. The legislation filed by Bowman notes there have been no confirmed cases of "white nose syndrome" in Iowa and that research shows the fungus is transmitted mostly by bat-to-bat contact. "It's just a shame not to be using it if there's no definite answer and it's inevitable that these bats are going to be exposed to it," said Bowman. Park Ranger Scott Dykstra says the D.N.R. is reviewing options that could allow restricted use of the caves possibly later this year. He says that a complete return to public use could still be months or years down the road. Niah Cave artifacts on way home?